There are a number of different species of midges, some bite while others don't. The midge in the main photograph appear to be the garden or phantom midge - there are no bloches on the wings. The one with the feathery antennae (top) is the male. The midge sucking blood in the inset photograph had three bloches on each wing. Some people confuse which midge is the biting one, usually mistakedly seeing fairly large flies as the culprits. The midge in the inset picture that is biting, as it happens the photographer, is no more bigger than a pin head. It is this small size that causes so much trouble as they are not easily seen. Midges are most active at dusk and dawn, if the weather is dull and wet for a period of time they will attack during the day. 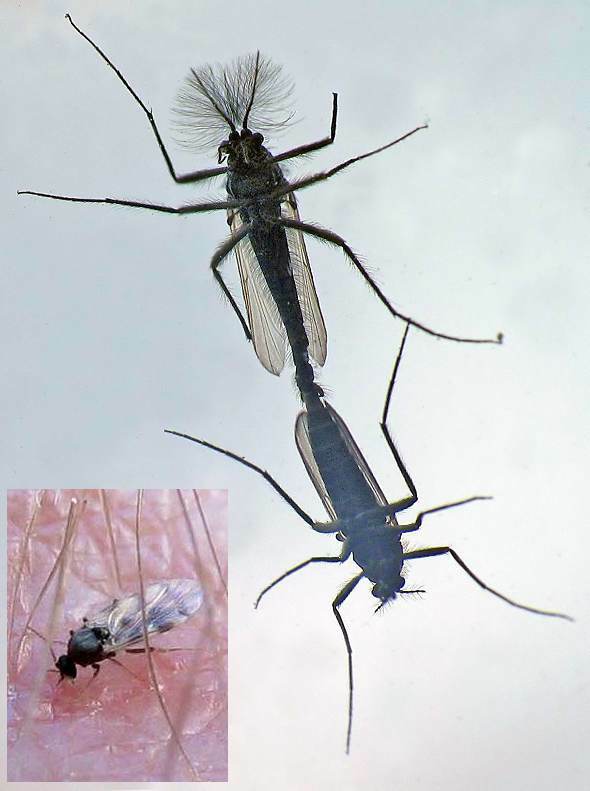 Male midges do not usually bite, it is the female that requires blood which is necessary for her eggs to develop. They detect their prey mostly by smell, carbon dioxide in your breath is one of the attractions. They have two lancets which pierce the skin, and gorge by sucking on your blood. The midge injects saliva to help increase the flow of blood, this is what causes the itching and allergic reaction. When finished they will secrete a pheremone which informs the other midges in the area that there is a free meal! To prevent being bitten, advice is to wear long sleeved clothing, this can be difficult on a warm summers evening. One of the ways to prevent being attacked by midges is to try to mask the smell of carbon dioxide. Methods such as "citronella" compounds which is an extract of a grass plant are used. Other compounds containing DEET can also work. Care needs to be taken in their application as they can cause reactions.